The British city of Gloucester [Gloucester] (center) basks in the morning sun between winter rain storms. 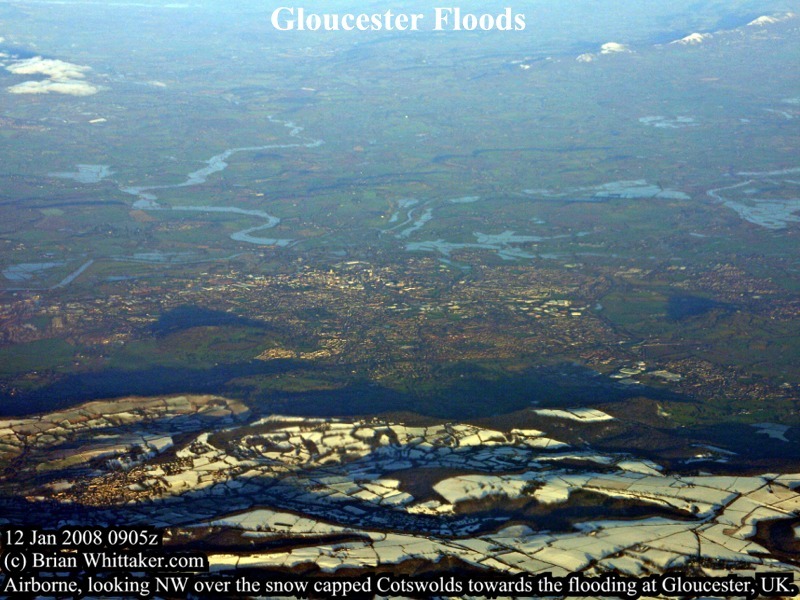 This airborne view looks northwest over the scenic and rarely snow capped Cotswolds [Cotswolds] and beyond to the Malvern Hills [Malverns] (upper right). The River Avon joins the Severn River [Severn] just right of the photo and heads south (heads left) past Gloucester. Also joining the River Severn is the River Leadon which extends from Gloucester up to the northwest (top). All local rivers were flooding due to recent heavy rains [warning], [flooding], [flood map] with even more rains forecast in the future. Here are some local BBC News video clips: [video: warning], [video: Aerial ]. Interestingly, all this water flows south (left) into the Severn Estuary at the northeast end of the Bristol Channel, which experiences the second largest tides in the world. These tides cause the famous Severn Bore [Bore] which extends all the way back up river to Gloucester itself!